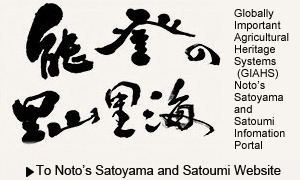 Noto was famous for its Matsutake mushrooms when people took good care of Satoyama areas with many Japanese red pines by thinning the forests to get firewood for the production of salt and ceramics. However, the postwar energy revolution brought about the devastation of Satoyama, which has resulted in a year-to-year decrease in Matsutake mushroom production; in Suzu City it is about one-twentieth of what it was at its peak. To improve the status quo, revitalization of Matsutake mushroom mountains was begun. In Kodomari, Misaki-machi, Suzu City, an NPO plays a central role in carrying out the so-called “two-layered forest management”, adapting to the features of local Satoyama made up of Japanese red pines and Japanese eurya. They try to provide an appropriate amount of sunlight to Matsutake mushrooms by cutting down trees other than Japanese red pines and Japanese eurya, which are tall and short respectively. In the Nagasaki area of Notojima, Nanao City, a “project to revitalize Matsutake mushrooms through salt-making” has begun. While considering the feasibility of reviving salt production, they managing forests by securing pinewood and removing dead pinewood. In Anamizu Town, the Satoumi Satoyama Revitalization Association of the Ninzaki and Shigaura areas is playing a major role in the revitalization of Matsutake mushroom mountains.